Making things yourself instead of buying them is an easy way to save money! There are so many things that are cheaper to make yourself then to buy. 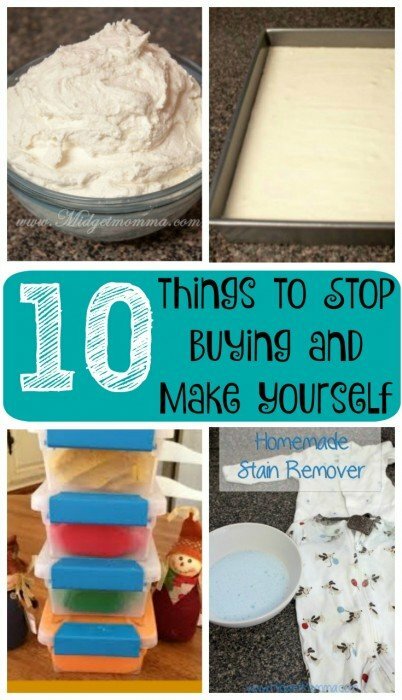 Here are 10 things to stop buying and make yourself to help you get started! See the rest of the 31 Ways to Save $100 or More Per Year posts here. There are many ways that you can save money and somethings that you might not even realize you can save on. There are things to stop buying and make yourself that you might not even think of, but doing so will save you money. These items are some that we do not even think twice about buying when we are at the grocery store or doing shopping in general. These things to stop buying and make yourself are fairly easy to do and make, and most do not take a lot of extra time but they will help you save money. Frosting– Not only is the frosting that you buy off the grocery store shelf more expensive but it does not taste anywhere near as good as homemade frosting. Use this homemade frosting recipe instead. Bakery cakes– Instead of spending $15-$20 on a cake at the grocery store bakery use this How to make a boxed cake taste like a bakery cake recipe instead. It will cost you a lot less, plus it tastes a lot better too. Then use the frosting recipe above for your frosting. Best cake EVER! Ice – Skip buying bags of ice at $2 a piece. You can grab some ice trays and make your own ice at home. It is so much cheaper! Stain Remover – You can make homemade Stain Remover at home super easy. Plus you can save a lot of money making your own instead of buying it. Ice Tea – Buying Iced Tea in the store is expensive, buy tea bags and make your own at home. Buy one of the iced tea makers and it is really simple! Foaming Hand Soap – Foaming hand soap makes washing hands easier because it saves money because you use less soap. But you can stretch the money even further by making your own Foaming Hand Soap. And it is easy to make too! Bath Stickers– They can get costly, but of course the kids love them in the tub so we buy them. Did you know you can make them sooo easily it is not even funny. Follow these directions for easy to make bath stickers and you can make them for your kids in any shape they want them in! Cloud Dough – You can buy cloud dough in the store, but it is costly. It is also not good for the younger kids if they are putting their hands in their mouth. Making this homemade cloud dough not only saves you money but it is safe for the kids to use and if they put it in their mouth or put their hands in their mouths when playing with it it will not hurt them. Coloring Books – You can print coloring pages of just about any character your kid wants. Just use google and search for “free coloring pages” you can also print out many different ones here. Some of them are Star Wars Printable Coloring pages, Inside Out Coloring pages and other Disney Coloring pages. Everyday for the month of October we are sharing a different way to save money. Each of these ways can help you save over $100 each per year! See the rest of the 31 Ways to Save $100 or More Per Year posts here. Using these ways to, you can save $100 in 31 different ways and you have a savings of $3100.00 in a year (if not more!)! These are all good ideas except for the coloring pages. It costs alot to print things. In my opinion it would be cheaper to buy the dollar coloring books that gives you a whole book for just a dollar. Great ideas! I need to start making my own frosting. Great ideas, thank you for including the recipes for play-dough. My daughters are finally old enough for me to make it at home without them trying to eat it all the time (I like to add Lavender Essential Oils to make it smell nicer). I really agree with making things at home yourself, lately I have stopped buying even cake mixes, making a simple white cake at home is so simple, and then you can really know what is going into it. Plus, then you can substitute thing to make it into a banana cake, chocolate, etc. there is so much more room to play with it!